Jean Judy makes charm bracelets using images from Jane Austen’s novels. She custom made the bracelet at left for me, using my favorite colors. These beautiful bracelets were also a hit at the last JASNA annual meeting, where Jean’s bracelets were worn by several members. View her selection in her Picassa Photo Album and on her blog, where her contact information sits. Click here to read Laurel Ann’s interview with Jean on Jane Austen Today. We then travel to Finland, where Päivi’s colorful folk bags remind me of reticules so popular in the 19th century. Stylish and beautiful, they would add to any modern wardrobe while evoking past times. Visit Päivi’s Flickr album here and her blog at this link. Reticules became popular when pockets were no longer sewn into the slim delicate dresses and skirts so common during the Regency era. These small handmade bags, frequently beaded or tasseled, came in a variety of shapes and are made of silk, velvets, handmade lace, or knitted fabrics. 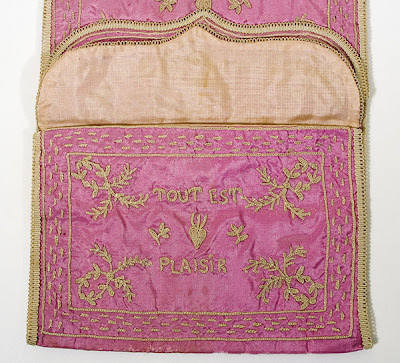 Most fashion plates of the Regency Era show ladies attired in walking costumes carrying a reticule similar to the one on top, circa 1800-1824 (Victoria and Albert Museum). These fashionable accessories were used from the late 18th Century through the flapper era in the early 20th Century. 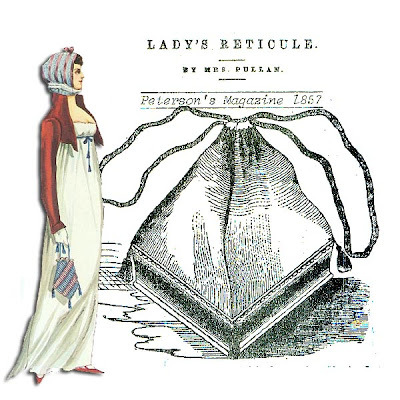 Please Don’t Ridicule My Reticule discusses the history of the purse, including the reticule.Click here. 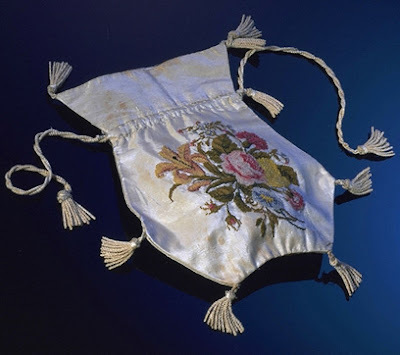 Jane Austen Centre: Reticule Order a pretty silk reticule from the Jane Austen Centre.